The evil scientist Dr. Robotnik has unleashed his most diabolical plot yet to turn the animals of Planet Mobius into robots. His monstrous contraption, the Veg-O-Fortress, built on Mt. Mobius, is already transforming happy creatures into mindless slaves! Robotnik's fiendish machine draws its power from the mountain's volcano. Fiery lava fuels the lethal Pinball Defense System that protects the Fortress. Sonic and his pal Tails mount an air assault on the Fortress, only to be blasted in mid-flight by Robotnik's cannons. Sonic is knocked into deep waters near the volcano. But he has friends in wet places -- and is saved at the last moment! Sonic sneaks into the Toxic Caves below the Fortress. From there, he infiltrates Robotnik's vast and deadly defenses. In no time at all, Sonic starts swiping Emeralds, freeing the animals of Mobius and dishing out hedgehog justice! Yo, Robotnik! You're in for a mountain of trouble now. Sonic is spinning into action! Sonic Spinball is a lot of fun to play! It mixes two things people love: Sonic the Hedgehog, and Pinball. The graphics and sounds were pretty good. I used to play this game a lot. It's cool because you can try to beat the game, or you can just see who can get the highest score. 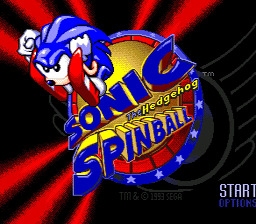 If you like Sonic or Pinball, Sonic Spinball is right up your alley! The evil Dr Robotnik is back again. Now Sonic (and you) must stop him, in this pinball style game!